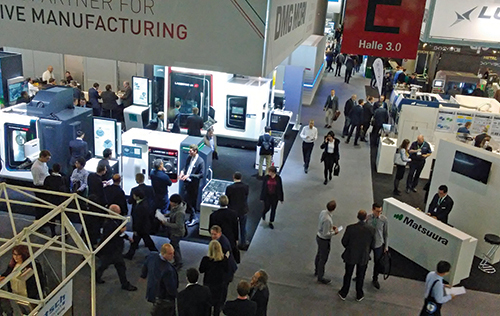 In just its third year, the 2017 edition of the annual formnext additive-manufacturing (AM) expo and conference experienced huge gains in the number of exhibitors and attendees, “bolstering formnext’s reputation not only as the industry’s leading exhibition but as a key source of inspiration for the sector,” says Sascha F. Wenzler, vice president for formnext. During our four days at the show, we spoke with attendees from all over the world representing companies in the aerospace, automotive, medical, oil and gas, and other industries. All were equally excited about the new technology on display, and perhaps even more excited about the bright future metal AM has for so many industries. And, of course, we walked the show’s aisles and visited with several exhibitors of machines, software, consumables and more for metal AM. A few overriding themes emerged while discussing new products debuted during the show. Productivity and throughput is a top priority—among the technology enabling this shift are larger powder-bed machines with as many as four lasers in action simultaneously, and with higher-power lasers; new process-automation technology; and optimized powder-handling systems. Powder-bed machines capable of achieving higher build-plate preheat temperatures—to 500 C, which helps to overcome process limitations due to thermal effects. This enables printing parts with more complex designs and from a broader set of base materials. Impressive new software products capable of modeling and simulating the build process (even capable of modeling the build microstructure) to allow offline process optimization, and software for developing support structures that promises to greatly streamline the art-to-part timeline. Here’s a taste of what we saw; look for more in future issues of 3D Metal Printing. 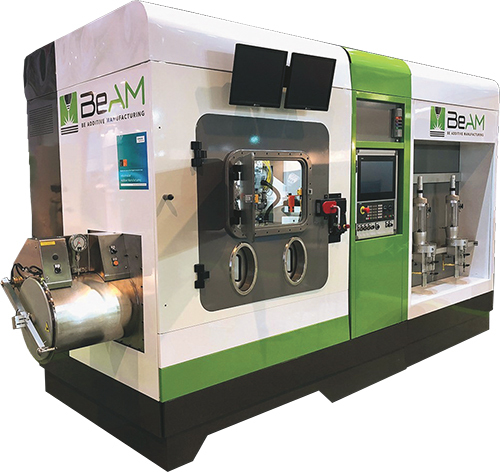 French-based BeAM Machines introduced its Modulo 400 machine, a direct-energy-deposition unit designed for industrial-scale metal AM while minimizing required floor space. Company representatives explained that peripheral equipment including the laser, chiller and fume extractor are integrated into the machine cabinet, which minimizes the overall machine footprint. That design also makes the machine relatively portable—it can fit inside of a shipping container for transport to offshore oilrigs, military bases and other remote sites. The Modulo 400 features a 2-kW fiber laser and can accommodate multiple deposition heads, as well as a light-duty milling spindle for dry machining. Also noted: Early in 2018 the company expects to introduce the Modulo 250, an even more compact version of its DED system aimed at R&D operations and capable of producing small part runs. A handful of exhibitors appear to be focused on the desire to use metal AM to print very large parts, and the solutions we saw in Frankfurt vary in concept and capabilities. 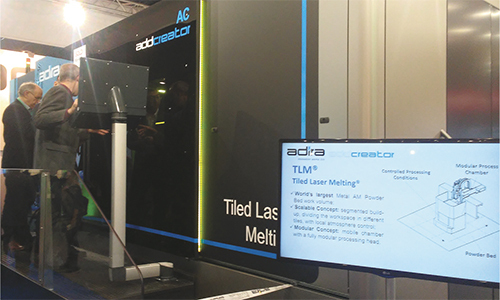 One such exhibit attracting a lot of attention was that of Adira, which explained to 3D Metal Printing the benefits of its tiled laser melting (TLM) process. TLM printing divides the powder-bed work area into small segments or tiles, which the machine processes sequentially and then stitches together using overlapping scan fields to achieve the final part. Dubbed AddCreator, the machine includes automated powder handling for easier cleaning and sieving of used powder, as well as quicker supply and storage. Additionally, integrated laser and process-related equipment contributes to a clean and efficient work environment. The build envelope measures 1020 by 1020 by 520 mm, with a maximum build rate of 40 cm3/hr. with one 400-W laser; maximum scan speed is 9 m/sec. Use it to print with steel, Inconel or cobalt-chrome. One of the parts demonstrated during the Frankfurt trade show was a bladed turbine disk. The machine can process nonreactive metals, and engineers at the show explained to us that they are developing parameter sets for printing steel alloys. Not all new metal printers are aimed at large parts. 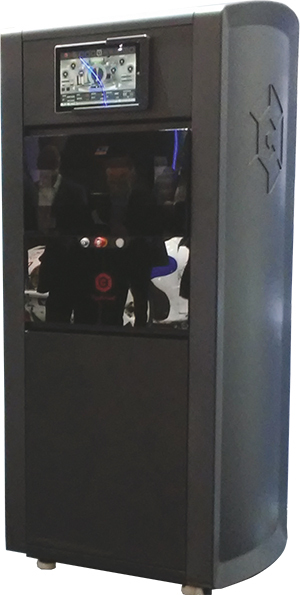 Case in point: the new Orlas Creator Hybrid printer/milling machine from O.R. Lasertechnology Inc., with a target customer base including medical and dental parts. Visitors to formnext saw a concept machine. It should be available to the market by year-end. 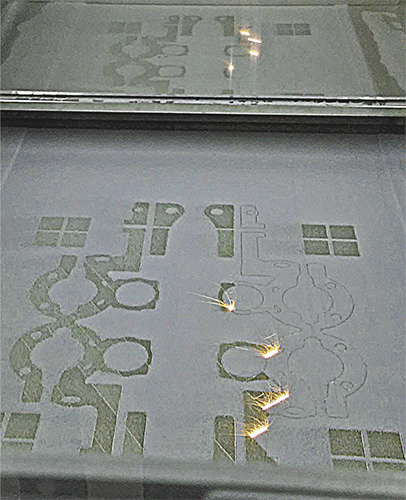 The combination additive and subtractive (three-axis milling) machine, according to company officials, extends beyond the capabilities of classical milling and machining, due to its ability to mill every five to 10 layers—inside of structures and surfaces not normally reachable, such as inside contours, undercuts or hidden cooling channels. Otherwise, the hybrid offers all of the 3D-printing features of the company’s original Creator metal-AM machine, including a 250-W laser that generates a spot size of 40 μµm, and a processing speed that maxes out at 3500 mm/sec. Build platform: 110-mm dia., 100-mm Z axis. 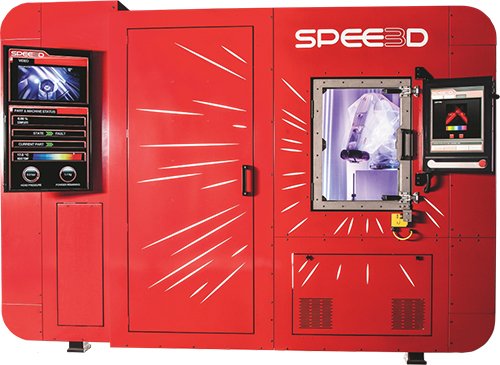 Spee3d debuted to formnext attendees a new metal 3D printer that leverages “supersonic deposition technology to deliver manufacturing-grade printing at production speeds,” said company officials. Designed for scalable, just-in-time production, the machine reportedly prints metal parts in a matter of minutes, compared to the industry standard of hours or days. Rather than using heat to melt metal powders, the machine’s patented technology uses supersonic deposition in which a rocket nozzle accelerates air to three times the speed of sound to deliver manufacturing-grade metal and high-density parts. Researchers at Charles Darwin University, in Australia, use the machine to print aluminum and copper alloys. 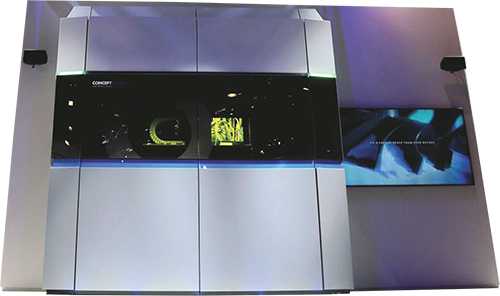 Another large-format machine on display starred at the booth of GE Additive, which unveiled its beta machine dubbed Atlas (additive technology large-area system). It boasts a 1.1 by 1.1-m build plate and a 30-cm Z axis, although engineers we spoke with stressed that the design is easily scalable to allow a significantly larger Z axis. The setup at formnext featured a 1-kW laser (reportedly scalable to include additional lasers). Engineers described the use of discrete dosing to save on powder consumption and related costs. And the Atlas machine includes process and machine-health monitoring enabled by GE’s cloud-based Predix operating system. Materials in play for this machine include cobalt-chromes and superalloys such as Hastelloy and Incoloy. We learned that the company is targeting applications that require large, complex parts, and that the first few beta machines are being evaluated by a small group of customers, with more planned for delivery in 2018. 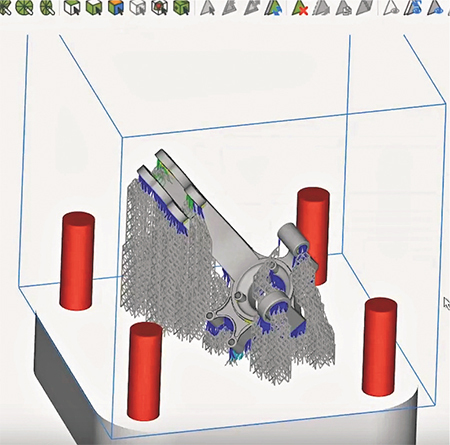 On the software front, Materialise debuted its e-Stage for Metal, reportedly the first software that automatically generates support structures for metal-AM parts. For more than 10 years the company has provided automated support-generation software, called e-Stage for Stereolithography and DLP technology. With the introduction of e-Stage for Metal, automated support generation becomes available for titanium, aluminum and stainless-steel parts. Compared to manual support generation, company representatives say that users can reduce the time to design supports by as much as 90 percent; reduce the time to remove supports by as much as 50 percent; and cut the time to finish parts by as much as 20 percent. In addition, the software will dramatically reduce the amount of powder trapped in the support structures. Materialise also used formnext to highlight its recent license agreement with Simufact Engineering GmbH. The collaboration allows users of Materialise Magics software to apply Simufact Additive simulation-software routines to better control the prebuild process. In addition, support structures in the Simufact software will be represented with Materialise Magics features so that Magics users will be able to predict errors before production. Company representatives explained that the software partnership will reduce the number of prototypes required during process development, as well as improve part quality. As noted previously, themes emerging from formnext include external part and powder management, 500 C build-plate preheating, three 500-W fiber lasers that allow scanning of the entire build area, and other functions to drive productivity gains. 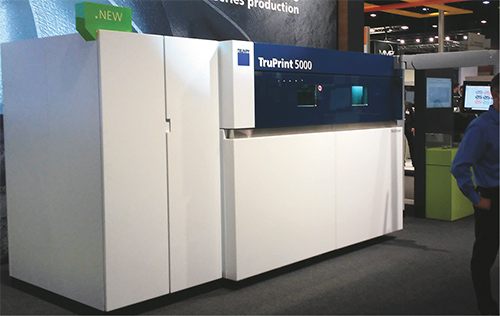 These and other advancements were evident at the Trumpf booth, which showcased the new TruPrint 5000 semiautomatic laser metal fusion machine. Officials explained that the machine excels in producing complex parts as large as 300-mm dia. and 400-mm tall, from any weldable alloy. Of note is the machine design that enables quick exchange of build and supply cylinders so that setup and production can occur in parallel, optimizing machine availability. In addition, the external part and powder-management system includes a sieving station, unpacking station and powder silo, again to allow this work to occur parallel to production while also ensuring operator safety. Back on the big-bed train, we spied the new SLM 800 laser powder-bed machine that features as many as four 700-W lasers along with new permanent-filter technology, melt-pool monitoring and laser-power monitoring, as well as improved machine-control software and an optional powder feeder that employs vacuum technology. As with other large-bed solutions, the machine design facilitates integration alongside a fully automated handling—unpacking, preheating, cool down, powder removal and powder transfer all can occur without operator intervention. 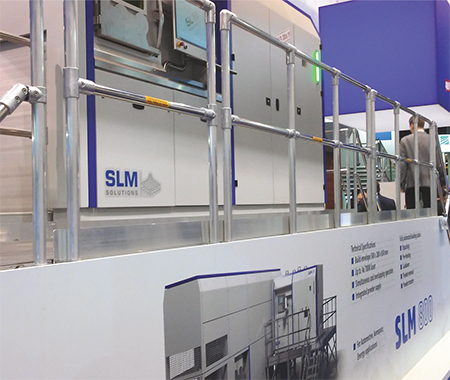 After presenting the machine to the crowd at formnext, SLM announced receipt of a major order for 20 units. Deposition rates to 150 cm3/hr. Build volume: 250 by 250 by 350 mm.